One of my recent DVD purchases was the Japanese R2 DVD of Neko no Ongaeshi, "The Cat Returns the Favor," or simply The Cat Returns, as it's known here. I bought this largely to fill out my Studio Ghibli collection and not much else. This was a film that I enjoyed, but never really loved, and I've discovered that my enthusiasm for it waned over time. Last year's DVD release in the US did little to change my mind, and I assumed that would be the end of it. So perhaps it's just being a little older and a little wiser, or having a greater understanding of cinema and Japanese animation; maybe it's the 21" widescreen monitor (my old monitor was 15" square). Whatever. Mere excuses. 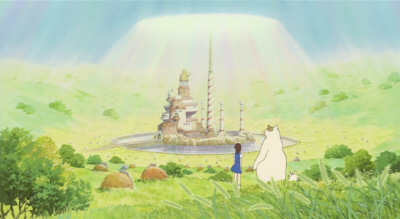 The point is that now I'm finally able to realize what many others already know: The Cat Returns is a really good movie. The script by Reiko Yoshida was taken from Aoi Hiiragi's graphic novel (she also wrote the original Mimi wo Sumaseba comic), and it likewise has that loose, episodic feel that's common with a lot of Ghibli films. The misadventures of Haru, a 17-year-old student who rescues a cat from a runaway truck, dips and veers and changes gears several times before finishing. It begins in Tokyo as a realist teenage drama, in the vein of Mimi, aka Whisper of the Heart, focusing on Haru stumbling through her day. There's even a pretty boy she has eyes for, in the tradition of Japanese romance comics, though, oddly enough, nothing ever comes from it. Only a couple wistful glances. It's well known that the idea for The Cat Returns came from Miyazaki, who wanted to spin off the two cat characters from Mimi into their own movie, and it's in the second act when they make their appearance. The picture itself shifts gears to meet them, visualizing a world where cats walk on hind legs, talk, and organize parades whenever people aren't looking. The rescued cat is revealed to be a prince of the Cat Kingdom (how un-American! ), and the King, himself something of an oddball, makes it his business to shower his favors upon poor Haru. It's these scenes, when the magical world of the cats meet the everyday world, that I like the best. I enjoyed them on my first viewing, too, and felt slighted when the story wouldn't stay put, just where it was. The endless series of surprises - those tall cattails, the locker room full of lacrosse sticks, the endless assault of catnip-crazed cats, and the live mice that bring everything crashing down at once - is the highpoint of the movie. Finally, Haru is introduced to Muta and The Baron, who seems decked out like a pocket-sized Sherlock Hound in his tiny Victorian home. End of part two. An army of cats from the kingdom wisk away with Haru, and sets off one of those speedy, well-paced chase scenes that's practically required in Ghibli films. It's the kind of crowd-pleaser that audiences still clamoring for Spirited Away would enjoy, and even if it's a sop to the masses, so what? It works, and goodness knows how many movie directors can't construct a decent action scene. Parts three and four take place in the Kingdom of Cats, which, if nothing else, is a beautiful place to visit. The endless green meadows, the clay-and-rock huts, and the tall patches of cattails (always with the cat puns, oy! ), all drawn with that fresh, painterly look that Ghibli's artists do so well. It's only one scene set outside, and that's a shame, because it's much better to look at than the king's dreary, run-down castle. Surely, a Kingdom of Cats would rather play in the grass than sit in some boring throne room, or bumble through that Rube Goldberg maze en route to the tower leading back home. Of course, if that happened, then we wouldn't be able to go through all the goofy fight and chase scenes, a very thinly-veiled homage to the greatest of all anime comedy bits, the castle seige from Puss in Boots. Small surprise that Miyazaki (along with Yasuo Otsuka) was responsible for that; small wonder that he and everybody else have been robbing it blind for the last 40 years. Again, I appreciate this second half much more now that I know what's being quoted, even I still have to heckle the screen for some of the more shameless theft. Cough, ripoff! At least Haru doesn't get dropped into the middle of a cattle stampede. I'm also not much of a fan for the you-should-just-be-yourself moral preaching; it's just the sort of dewey schmaltz I expect from Disney. You'd think a movie loosely spun off of Mimi, which thouroughly demolished such dishonest cliches, would do better to avoid this. So The Cat Retuns isn't a perfect movie, or even a modern classic. Big deal. It's an impressive work for a first-time director, Hiroyuki Morita, who was still in his early '30s. He clearly has room to growto better understand editing and rhythm, and he needs to master comic timing. That only comes from experience, and endless watching of the Marx Brothers and Bugs Bunny cartoons. There's a lot of talent at Ghibli, including a number of people who have experience directing short films, so I honestly don't know where Morita fits in 2006. I hope he has the chance to direct another feature, although I cannot expect him to carry the studio on his shoulders. He's not an A-list director yet, but he someday could be. Here's what I like best about this movie: the artwork is terrific, the character designs are sharp, the pop song at the end is irresistably catchy, and the length, 75 minutes, is just about right. Its patchwork quality would come undone if forced to stretch to a full two hours. It's perfectly suited for its double bill with Ghiblies Episode 2; they really compliment each other, and it's a damn shame that Disney would seperate them for the US DVD. But I'll have plenty of time to rant about that another time. It's pretty sad how this movie didn't gross as much as the others did. I still found it fun, catchy and the cats were sooo cute!